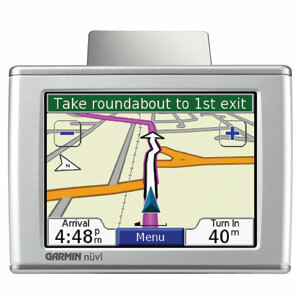 The sleek, portable nüvi 350 is a GPS navigator, traveler’s reference and digital entertainment system, all in one. It is your pocket-sized personal travel assistant ready for adventure. Like the rest of the nüvi 300-series, you’re just a few screen taps away from anywhere. nüvi 350 comes ready to go right out of the box with preloaded City Navigator® NT street maps, including a hefty points of interest (POIs) database with hotels, restaurants, fuel, ATMs and more. 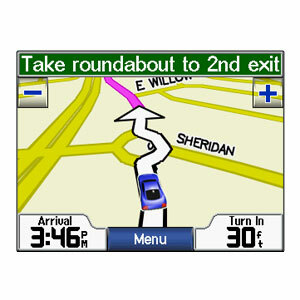 Simply touch the color screen to enter a destination, and nüvi takes you there with 2-D or 3-D maps and turn-by-turn voice directions. It even announces the name of exits and streets so you never have to take your eyes off the road. In addition, nüvi 350 accepts custom points of interest (POIs), such as school zones and safety cameras and lets you set proximity alerts to warn you of upcoming POIs. The European version even includes a preloaded safety camera database containing the location of safety cameras for parts of Europe. Avoid traffic jams with the addition of an optional FM TMC traffic receiver and traffic services. By adding these to your nüvi, you are notified of accidents or road construction ahead on your route. 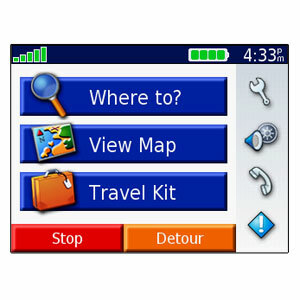 Simply touch the screen to view traffic details or recalculate your route to avoid traffic. Like the rest of the nüvi series, nüvi 350 sports a sleek, slim design and fits comfortably in your pocket or purse. Its rechargeable lithium-ion battery makes it convenient for navigation by car or foot. Navigation is just the beginning. 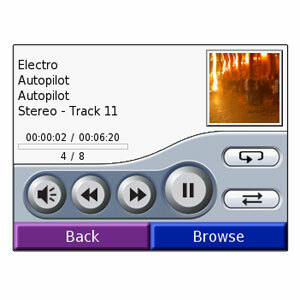 nüvi 350 includes many “must have” entertainment and travel tools including MP3 player, audio book player (subscription to Audible.com required), JPEG picture viewer, world travel clock with time zones, currency converter, measurement converter, calculator and more. It also comes with Garmin Lock™, an anti-theft feature. Enhance your travel experience with optional plug-in SD cards.